Until now, Marvel’s biggest cinematic gamble was Iron Man. Remember when people were shocked that Robert Downey Jr. was going to play a superhero and questioning how the heck that thing would be a moneymaker? That worked out pretty well for all involved. Guardians of the Galaxy is another risky proposition in that it’s a relatively unknown comic team – outside of the die-hard circles – with a broad assortment of colorful (many times literally) characters navigating multiple planets and complicated mythologies. This one works, too. Embracing the eccentricities of the characters and their wacky worlds, the Marvel machine has cranked out one of the most fun entries in their cinematic universe, injecting some much-needed quirk into their typical template. 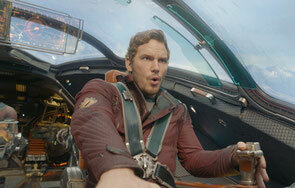 Peter Quill (Chris Pratt) is abducted from Earth in the late ‘80s after a traumatic event. In present day he’s a space forager working for a group of scallywags called the Ravagers, led by Yondu (Michael Rooker). His latest acquisition is a metallic orb that draws the interest of several parties, including the evil Ronan (Lee Pace), bent on literally destroying the worlds of his rivals. He dispatches assassin Gamora (Zoe Saldana), adopted daughter of King Thanos (voice of Josh Brolin), to retrieve the object. 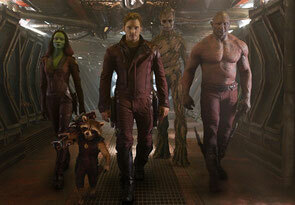 Quill, who self-identifies as Star-Lord, and Gamora become entangled with a couple of bounty hunters: talking raccoon Rocket (voice of Bradley Cooper) and walking tree Groot (voice of Vin Diesel). The foursome eventually land in jail where they cross paths with brute Drax the Destroyer (Dave Bautista), who has a history with Ronan. Staging a breakout, these five unlikely allies unite to stop Ronan’s nefarious plans. Don’t worry, it all makes sense in the moment. Director James Gunn and his co-screenwriter Nicole Perlman have crafted a rollicking intergalactic adventure that smartly keeps the focus on its appealing band of rogues as they navigate vivid worlds. The detailed space environs are breathtaking, including the floating skull of an extinct deity that’s being mined for resources. Action sequences are amazingly rendered and choreographed, never convoluted or confusing, allowing us to just sit back and enjoy the ride without having to question the makeup of this universe. Many of the high points are made even more enjoyable by the collection of ‘70s and ‘80s rock tracks on Peter’s mixtape, his last connection to Earth. Also welcomed is a return to pure blockbuster excitement that recalls a far, far away galaxy introduced a few decades ago. The brooding is left to a minimum. There are obvious correlations between Star-Lord and Han Solo, not the least of which is Pratt’s comedic charisma that recalls a young Harrison Ford. The cast is uniformly great, from Saldana’s aggressive green hitwoman, to Bautista’s musclebound beast who can’t grasp the concept of sarcasm, and Cooper’s tough-talking raccoon. Everyone finds the appropriate amount of wit, even Diesel in his readings of the same three words (“I am Groot”) over and over again. Known names in smaller roles – Glenn Close, Benicio Del Toro, John C. Reilly – hint at an expanded universe ripe for more exploration, but thankfully Guardians of the Galaxy is a self-contained adventure. Unlike so many recent comic book movies it doesn’t feel like a minor preamble to something greater, but a complete chapter with the promise of more great things to come. One piece of the playbook that feels a little too familiar is a final act with spaceships crashing and ramming into buildings. At least it’s an alien city with unique architecture and not New York or Chicago, I guess. The conflict of epic proportions wraps up a bit conveniently, but the journey to get there is satisfying and, more importantly, not a chore to sit through. Guardians of the Galaxy is good old-fashioned, genuine fun, which has been in short supply is this genre for too long.